Did you notice more people on the trams and trains going into the city from Moreland, not to mention more cyclists going into the city? I did. We were all going in to attend the People’s Climate march, a global event at 2700 locations in 160 countries. Some big, most small, and a huge turnout in New York. New York hosted the main march to send a strong message to the 120 plus heads of state attending the Emergency UN climate summit called by UN Secretary General Ban Ki-moon. And what a march it was with early estimates of 310,000 people, later revised upwards due to the large crowds to 400,000 people. It is the largest climate protest that has so far occurred and compares with similar large protests in the US on moral and ethical issues. 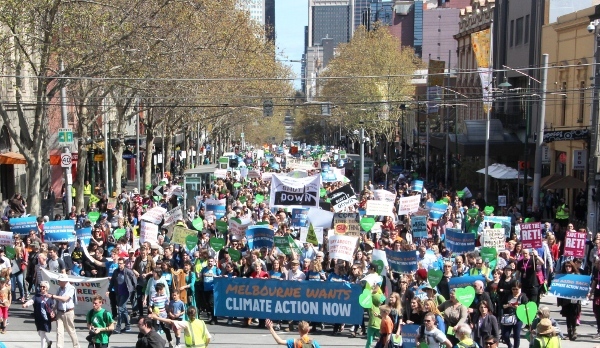 Here in Melbourne we were part of a 30,000 strong protest, a rebuff to the anti-climate policies of the Federal and State Governments. There were also events in regional towns around the state. 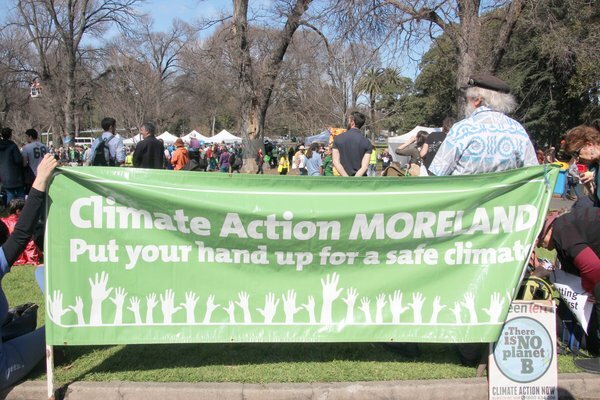 You can read my report of the Melbourne Peoples Climate protest and regional events at my blog. 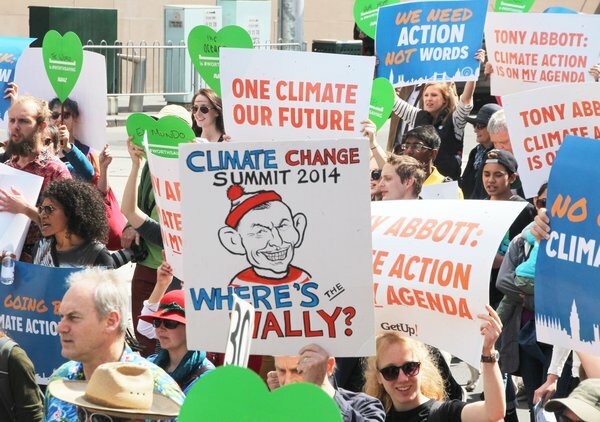 Unfortunately our Prime Minister Tony Abbott is a ‘climate Wally’ and is not attending the Climate Summit even though he is in New York the very next day to discuss the threat of terrorism. Instead he is sending Julie Bishop MP, the Foreign Minister, but with no increased targets to present. 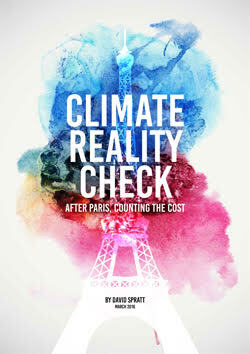 Also released today in New York is a new report by the Carbon Tracker Initiative which identifies major financial risks for investors in coal producers around the world, from the domino effect of slowing demand growth in China, where thermal coal demand could peak as early as 2016. The analysis shows that some of the world’s biggest greenfield coal projects in Australia’s Galilee Basin are already out of the money under a low-demand scenario. In the US, the potential expansion of mines in the Powder River Basin also has challenging economics. These areas also require major investment in infrastructure to deliver production to the Pacific market, and new ports on the US West coast and adjacent to the Australian Great Barrier Reef have all faced opposition. 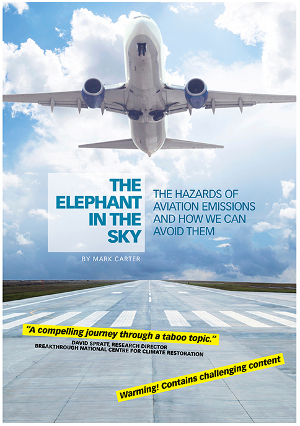 You can download and read the report: Carbon Supply Cost Curves: Evaluating Financial Risk to Coal Capital Expenditures. The head of the UN climate convention, Christiana Figueres, has warned this morning that coal has no future in the world’s energy mix and that coal reserves should be left in the ground to avoid catastrophic climate change. If the Galilee Basin in Queensland were a country, burning its coal would make it the seventh largest emitter of CO2 on the planet. Will the government now agree that it should not be such a shameless cheerleader for the mega coal mines proposed for the Bowen and Galilee basins? Senator Cormann responded in a cavalier attitude that it was all to promote economic growth. That coal would and should play a substantial role in our energy sector and export market. But what use is that growth when we are destroying the climate, the atmosphere, the oceans, our environment, our home? Clearly the Government is not paying attention the the world’s climate scientists, and global institutions like the World Bank, International Energy Agency and financial and economic reports that are increasingly warning of unburnable carbon and stranded assets and with global emissions still rising on the path to dangerous 4 degrees celsius warming or more by the end of the century. Watch the video of the question and response or read the transcript. The North Queensland Conservation Council (NQCC) (see Facebook)certainly got their message right for their Peoples Climate Action event on a Townsville beach on Sunday particularly in regards to our Government but also many politicians globally that have been slow to listen to the scientific experts. Imagery courtesy of crankycurlew productions. George Hirst from Cranky Curlew told Mashable in this article that the protest hoped to highlight the way our leaders are ignoring a planetary emergency. 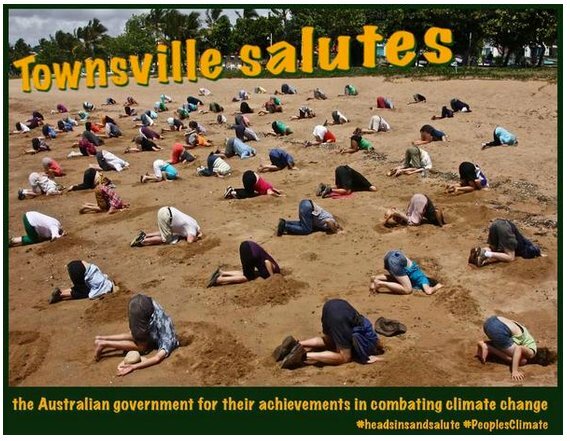 Well done Townsville residents and North Queensland Conservation Council. Entry filed under: campaigns, Event, news, rallies & protests. Tags: coal, Larissa Waters, Mathias Cormann, peoplesclimate, Protest, Senate, Tony Abbott, Townsville.